Former Motherwell ace Bob Malcolm reckons old mate Ross McCormack will hit the ground running and his goals will help the Steelmen climb the Scottish Premiership table, writes Andrew Scott. Ex-Scotland international McCormack, who has signed a loan deal with the Fir Park club until the end of the season, was a team-mate of Malcolm’s at Rangers and during McCormack’s first spell at ’Well from 2006 to 2008. Malcolm (38) said: “Ross McCormack can score goals and that’s why Motherwell have brought him back. “They need to get goals into the team, whether they play him up front or play him in the wider area coming inside. “He’ll definitely get goals, at setpieces he’s unbelievable, free kicks and corners. “It’ll be a massive boost, Ross has got a bit about him in the dressing room, he likes a laugh and a joke, but he also knows when to get serious. McCormack (32) played for the likes of Leeds United and Fulham after leaving Motherwell in 2008, but after a fall out with ex-Villa manager Steve Bruce after his £12 million move, he found himself out on loan. The 13-cap front man had an impressive loan spell with Melbourne City last season, scoring 14 goals in 17 appearances with the Aussie side. Injury then restricted McCormack to just five appearances for his next loan club Central Coast Mariners. He added: “They would’ve brought him back for a reason. He’s got a bit of experience of play, he’ll help the team and I hope that they start picking up points and start moving up the table because the longer you stay down there, the harder it is to get out. Malcolm – who now works as Barry Ferguson’s assistant manager at Lowland League outfit Kelty Hearts –saw McCormack’s development at Rangers. Bob was on the bench when McCormack scored on his Champions League debut for the Gers, nettng the equalising goal against Porto in 2005. Despite then being given limited chances by then Gers gaffer Alex McLeish, Malcolm knew McCormack would have a successful career. He said: “I knew Ross as a kid at Rangers, coming through and playing in the Champions League. I saw that he had something about him, a certain quality. “But then he went to Motherwell and lost his way a little bit. “Then Mark McGhee came in and gave him a new lease of life with plenty attacking football and since then he’s never looked back. “He’s left Motherwell and went onto a few big, big clubs. He always had the potential. Malcolm, who spent a season with the ‘Well in 2008, believes that the club are in a similar situation to the one he experienced following the club’s run in the UEFA cup. He added: “The year I went to Motherwell, the first six months that I was there, finishing third and getting into Europe was a big thing. “I think it was the last game of the season where we drew against Aberdeen 2-2 and then that got us into the UEFA Cup qualifying rounds. 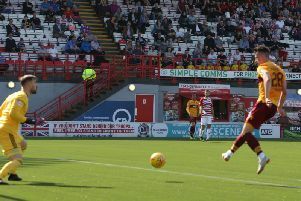 The former utility man believes that after the successes of last season, it’s harder for a club the size of Motherwell to have a following season as good. “A club the size of Motherwell getting into both major cup finals in Scotland is massive,” he said. “You’re always going to get a disappointment the next season because teams will always come and take their better players, because they’ve not got a great deal of money. “The games that I’ve seen this season I think they’ve actually played well, but they’re not getting the rub of the green and getting a goal at the right times and they end up having to fight back into the games. “That’ll come, if they keep play the way they are playing then they’ll get the results. And with Ross coming back he’ll give them a boost and I think they’re only going to get better from now on.